NEWPORT BEACH, Calif.--(BUSINESS WIRE)--Paramount Defenses, a global cyber security company founded and led by a former Microsoft Cyber Security expert, announced the availability of version 6.5 of its flagship Gold Finger Audit Tool for Microsoft Active Directory. From the U.S. Government to Wall Street, and from the Fortune 100 to the Fortune 1000, at the very foundation of cyber security and at the heart of privileged access worldwide lies Microsoft Active Directory. Today, at most organizations worldwide, all their building blocks of cyber security, such as user accounts, computers, passwords, security groups etc. are all stored, protected and managed within Active Directory. Thus, the vast majority of all privileged access and privileged user accounts at organizations worldwide reside not within organizational computers, but actually within organizational Active Directory deployments. “Privileged access is the new holy grail for perpetrators, and at most organizations, the lion’s share of all privileged access resides within millions of ACLs (access control lists) inside organizational Active Directory domains, equally identifiable by defenders and attackers,” said Sanjay Tandon, CEO of Paramount Defenses and formerly Microsoft Program Manager for Active Directory Security. The need to accurately identify and minimize who has what privileged access within Active Directory deployments is thus paramount to cyber security, and essential for maintaining organizational cyber security, implementing privileged access management (PAM) and performing privileged account discovery. The only correct way to accurately identify privileged access in Active Directory environments involves and requires the accurate determination of effective permissions / effective access on Active Directory objects, a process that unfortunately requires deep expertise and thus remains very difficult to correctly perform. Gold Finger from Paramount Defenses is the world’s only cyber security solution that can accurately and automatically determine effective permissions / effective access within and across Active Directory. 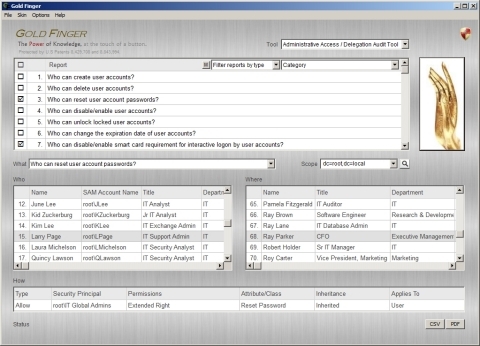 The Microsoft-endorsed Gold Finger embodies the company’s unique, patented privileged access audit technology, and is the world's only cyber security solution that goes beyond Active Directory permission analyzers to completely and correctly identify exactly who actually has what privileged access within Active Directory, based on the accurate determination of effective permissions. “For organizations seeking to perform privileged account discovery, implement privileged access management or demonstrate regulatory compliance of access rights in Active Directory, Gold Finger uniquely empowers their IT personnel and auditors to easily fulfill the #1 prerequisite for all these initiatives – the accurate determination of privileged access in Active Directory,” added Tandon. Gold Finger version 6.5 delivers support for Windows 10 and performance improvements designed to help organizations quickly, efficiently and accurately audit privilege access across their Active Directory, thus empowering them to accomplish in minutes what could otherwise take months. Gold Finger 6.5 is now available. For more information, please visit – www.paramountdefenses.com. Paramount Defenses is a privately held global cyber security company engaged in the development of tactical and strategic paramount cyber security defenses for organizations worldwide. It remains the world’s undisputed leader in the paramount privileged access audit and discovery space. Its customer-base spans six continents worldwide and over the years its customers have included the world’s largest software company, the world’s biggest Internet company, the world’s most powerful governments, as well as numerous prominent Fortune 10, Fortune 100 and other companies worldwide. Paramount Defenses releases Gold Finger 6.5, world's only accurate privileged access audit and privileged account discovery tool for Active Directory.